There is a lot of life on campus now that students have returned and classes will begin in just a couple short days. Facilities Team Green really enjoyed welcoming the class of ’22 at the EXPO last week, giving away solar powered flashlight key rings in multiple colors. 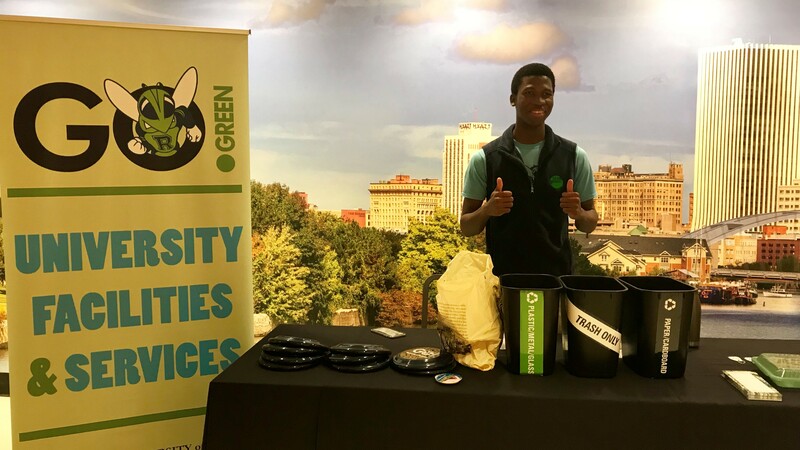 We had an extra fun time tabling at the Zero Waste Lunch on Friday with Dining Team Green to educate students on reusable options on campus and proper recycling techniques via the recycling sorting game. Pictured above is Facilities Team Green leader Kelly Jean tabling at this event. Just a couple weeks ago, our county announced some changes in what is acceptable for recycling. As a result of these changes, the University is also implementing a zero contamination goal! We will be playing the sorting game a lot this semester to get the message out to students, staff and faculty alike! Though summer tends to be a quieter time on campus in terms of student activity, a lot of behind the scenes preparations are always ongoing. Aside from all the construction projects that literally tear apart the campus to make it “ever better”, the Facilities crew in Res Life works especially hard to get everything cleaned up and ready for students. They helped consolidate electronics that were left behind and ultimately recycled as part of the Move-out Cleanout. Facilities Team Green becomes particularly friendly with the res life crew in the summer as they bravely complete the task of putting up our “Recycling 101 inSTALLment”…. in where??? The bathroom stalls of course! It takes several weeks to cover over 1,000 stalls. But the end result is worth it as students definitely notice this signage and can learn tons of information. We are especially thankful to have already been working with the EcoReps this year, including the first-year and upper-class members. During their pre-orientation, they received extensive training on how to recycle before the rest of their fellow classmates arrived. On move-in day the first-years helped flatten cardboard boxes and bring them out to the appropriate collection containers to ensure they would be recycled. They also helped with a special one-day collection of Styrofoam to be recycled by the local company Thermal Foams. A HUGE thanks to Kelly Jean and Teddi Shapiro who worked tirelessly all summer to maintain and improve sustainability on campus!! It always feels like a bit of a whirlwind by the time all the preparations are done and students have returned. Thanks for keeping our campus green everyone! We are looking forward to another great academic year!